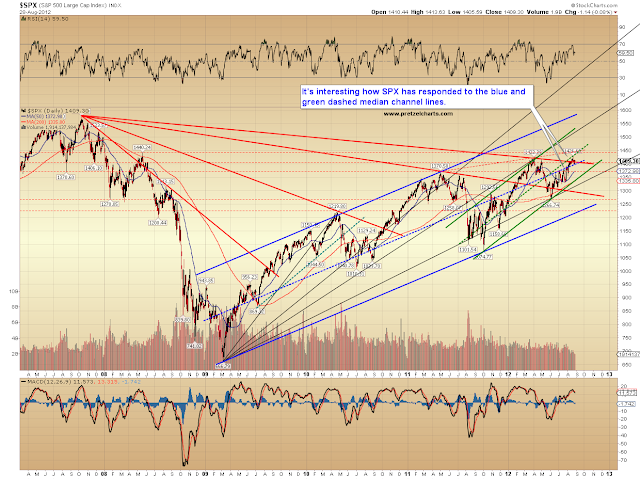 Pretzel Logic's Market Charts and Analysis: SPX Update: Market Sleepwalking Until Jackson Hole? 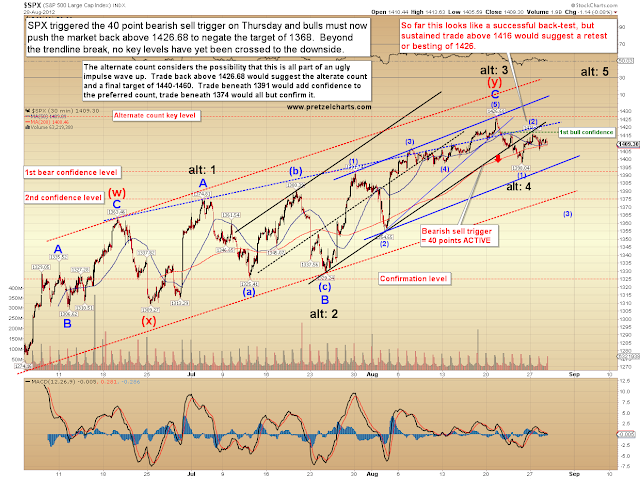 SPX Update: Market Sleepwalking Until Jackson Hole? I feel reasonably confident that an intermediate trend change is now underway. Obviously, trade back above the 1426 pivot high would suggest the alternate count is in play -- however, even if that were to be the case, at the bare minimum, I expect this high will hold for several sessions and lead to a decent correction. Well, it's done that much. Now it appears the market is in a holding pattern, waiting to see if Bernanke emerges from Jackson Hole and sees his shadow, in which case we get six more months of QE. Or maybe that's the groundhog... I can never keep the two straight. Anyway, there very little to add in terms of comments to the following charts. The first is a long-term S&P 500 (SPX) chart. 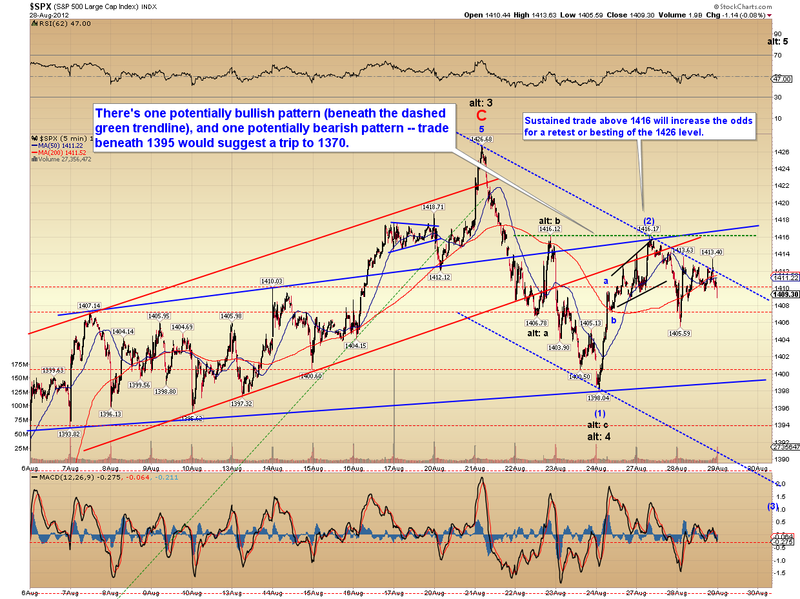 SPX is trying to hang on to its recent breakout. The next is a 30-minute SPX chart, and it outlines the key levels for the bulls or bears to claim in order for the market to begin making more headway. 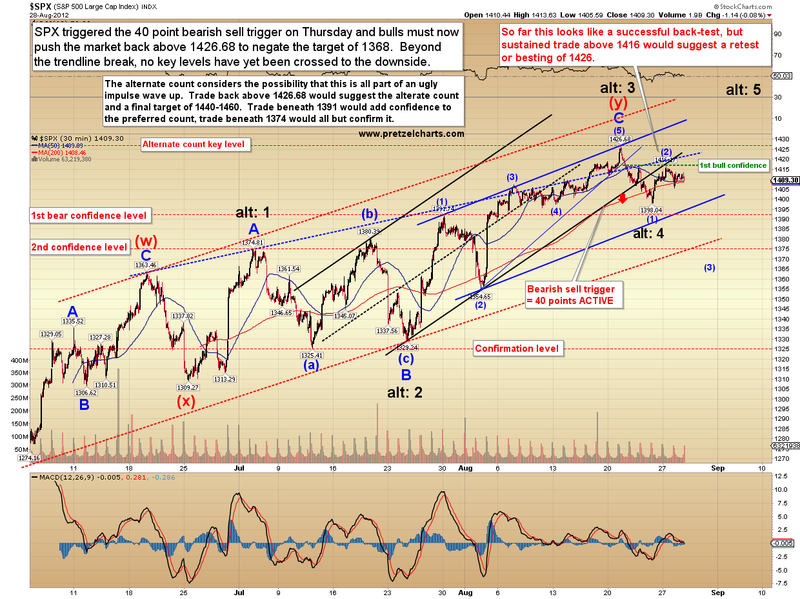 Finally, the 5-minute chart suggests the market is undecided and has set itself up for either outcome. There's one short-term bullish and one short-term bearish pattern evident on this chart, so the price action is more likely to run whichever way it breaks. In conclusion, the key short-term levels which provide clues remain unchanged from Monday and are outlined above -- and there's been no material change in the intermediate outlook for quite some time. I expected the last lunge higher and the subsequent turn; now I'm just waiting to see if the market is going to add confidence to the preferred count, or if the alternate count will play out instead... and at the moment, it appears the market is waiting too. Trade safe.